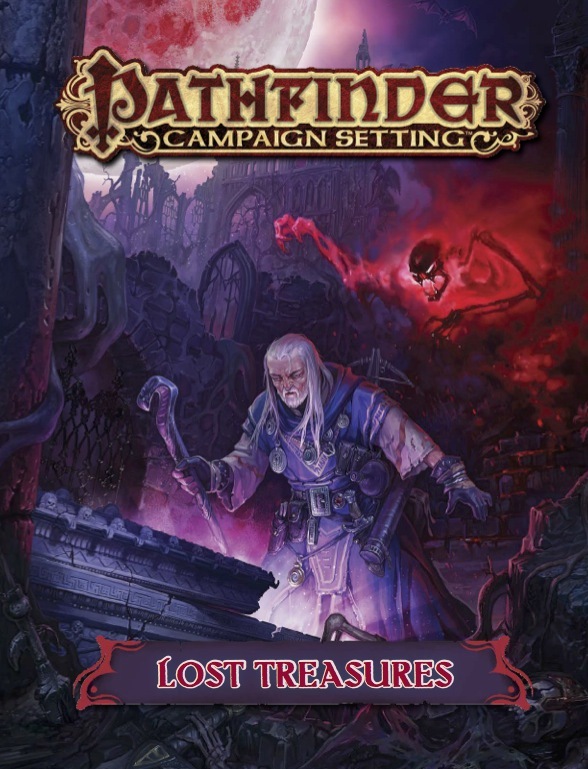 Pathfinder Campaign Setting: Lost Treasures is intended for use with the Pathfinder campaign setting, but can be easily adapted to any fantasy world. Lost Treasures provides a large number of unique (or nearly unique) magic items, complete with background stories and adventure ideas for using them. It's a good book for GMs looking to add a few treasures into the game that stand out from the typical +1 weapon or cloak of resistance. A few are powerful items; many others are considerably less powerful; some aren't even magic items, but just mundane items of high value or historical importance. However, all the items have their own individual character to them and will add a ton of flavour to treasure hauls. Even the mundane items here are anything but mundane. I would give it 4 and a half, but cannot. This is set up like the Artifacts & Legends book, yet not much in this book would break your campaign. Some of the stories behind these items make for very compelling reading (Like the Fiendsplitter). Some of my favorites include the Pale Maiden, Mistcaller and the Stories of Shazzarazed (or however that was spelled!). Very fun and useful book. This is a great book with lots of treasures. For GM's looking for unique or interesting items to add to an adventure this book is what you are look for. Some weapons, but mostly unique artifacts that you can build campaigns or sessions around. Highly recommended. Announced! Product description and cover image subject to change. That is certainly a great cover image. It is nice, I wonder were it is from? I should have remembered that since they are in there mythic outfits. Yeah, I can't wait to find out more about this one. Wow, I thought more people would be interested in this one. Not only are we getting like 50 different treasures, we also will be getting some cool story/history fluff to go with it. Honestly, between this and the Ranged Combat Player's Companion, November is kind of a let down for me. We're still getting more of Iron Gods so I'll definitely look forward to my monthly shipment, but both this and the Companion for the month aren't that particularly interesting to me. I am really looking forward to thus but after how much if a let down I considered both UE and Magical Marketplace, I am not holding my breath. Hopefully it has several items worth a PCs gold to purchase, and not just stuff we could only ever afford after level 10. I hate when a book only has one or two pages of worthwhile content. hate feeling like I am buying a book for 2 pages of micro transaction MMO style economy. I hope such material does nit get banned in PFS a month after I possibly buy this. I hate that page count would be wasted on sample treasure hoards. I often could care less about fluff but will try to keep an open mind for the potential adventure hooks. I do think magical treasure chests to protect the stuff is a cool idea along with new curses. I think this book sounds interesting enough to warrant buying. I too was let down by magical marketplace so I am putting my faith that this book will deliver more along the lines of what I want. I'd like to see some interesting/wacky intelligent items or an intelligent cursed item. I'd also like to see some cool weapons and maybe a new magical weapon enhancement. I just wish I didn't have to wait till November. That's the worst part about these announcements, I see it and go oh wow that's awesome I'd love to get this for my campaign. . .and it's due for November, 6 months away. This book will be more similar in its scope to Artifacts & Legends than to Magical Marketplace or Ultimate Equipment. Well what I want make clear is when it says unique treasure were not just talking about magic items, were talking about all kinds of stuff, correct? Also one line says were getting 50 unique treasures while another says stats for a dozen treasure hoards. So is this book focused on 50 different treasure items, or 12 treasure hoards, or both? Count me in, artifacts and legends is one of my favorite books. Well, considering CS books are 64 pages and 50 + 12 = 62, which is very close, I wouldn't be surprised if it was one page per item/hoard, plus two pages intro/outro. Artifacts & Legends was awesome. Rock on. Totally looking forward to this one!! Yeah is this looks like a book to look forward to. And it is coming out in the month as my birthday too. I loved Artifacts and Legends. Can we get a hint of something that might be in here? It'd put a smile on my skull if the other three elemental gems were in here. that is probably too much to hope for though. 12 different treasure hoards? My inner-Karzoug is brimming with delight. Bonus points if we get the stats on the sword from the cover of UE. How many covers has that sword shown up on by this point? Well, Alain was about to procure it on the Cover of UE, but we see Valeros actually wielding it on the cover of MA. This apparently took place before the iconics decided being Mythic means 'if got it -flaunt it' (and how!). Extra Bonus points if its name is '+3 Longsword'. I really hope this book has some new legendary item abilities, the ones in mythic adventures are very few. What sword is that on the cover? On Ultimate Equipment, the sword that Valeros was about to snag was Rixbrand. Also, hope this book gives rules for creating legendary artifacts for your own home games, for the purposes of power, etc. Given that Rixbrand exists for the express purpose of killing dragons I'm inclined to believe you -even accounting for some distinct differences in its appearance between the aforementioned sources and Lands Of The Linnorm Kings. Though, that is said to be a Greatsword it wouldn't be too difficult to make it a longsword with the same abilities using magic item creation rules. Well, that's one long-standing conundrum solved. And we didn't even need Occult Mysteries for the answer! I hate that this is so far out. Cover image and description updated. Ugh, all the way til December, eh? Well what else would Santa bring you? Coal? Meh, what I want I can't mention here. You had me at treasure though magic treasure chests is just icing to this yummy cake. Does any else get a Castlevania vibe from that cover art? The annual fall/winter slippage season has begun. It will be over when the releases currently scheduled for March slip to April, if the past couple of years are any indication. I have my PDF and I can field a few questions if anyone has any. Valeros was the only iconic I saw in a chapter opening. There was also art of Ezren and Seoni. Nearly every page has item artwork on it. 1)What does the Witchmarket Coin do? 2)Is the Gasping Pearl, the Garnet Brand and the Untouchable Opal in the book? 2)can you give us some names of some interesting items? 1)Witchmarket Coin (short answer) - opens a portal to the first world. 2) I did a search for all 3 and came up empty. If those are what I think they are, they wouldn't be in this. They are most likely to show up if Paizo decides to make an AP about freeing the Elemental Good Lords. 1) Short answer, it's an extraplanar compass. 1)what is the Bamboo Palace and what does it do? 2)what is the Eternal Egg and what does it do? 3)what is the Garden of Sulesh and what does it do? 4)what is the Scepter of the Arclords and what does it do? Does Witchmarket Coin do anything else?does it open a portal to to anywhere specific? What are some of the mundane items in the book? What is the Kiss of Noctura? Any items related to Calistria? Or any of the gods for that matter?